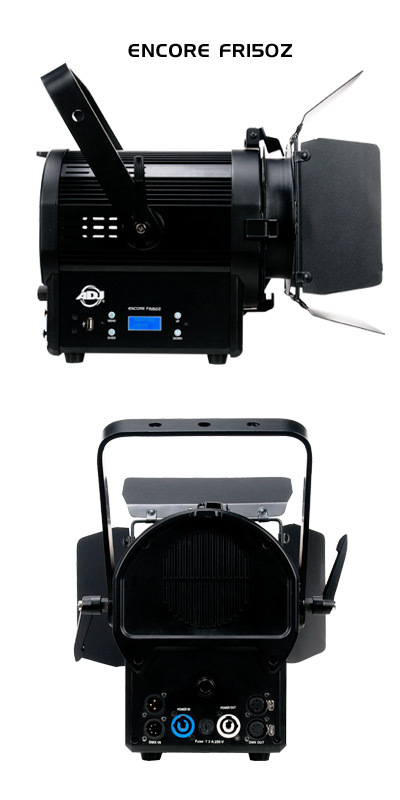 Following the success of ADJ’s Encore Profile Ellipsoidal spotlights, the Encore Series has been extended with the introduction of two new LED Fresnel fixtures. The Encore FR50Z and Encore FR150Z are powerful lighting units that are ideal for providing warm white illumination for theatre performances, conferences and other stage productions. Both of the new fixtures are powered by highly efficient and reliable LED light-sources and generate a soft-edged beam at 3000K with a CRI of 95. They feature barn doors to allow dispersion adjustment as well as a manual zoom control that allows the beam angle to be adjusted between 8 and 50 degrees. This means that the units are equally suited to providing a broad stage-filling wash as they are to generating a concentrated pool of light for highlighting particular performers or set elements. 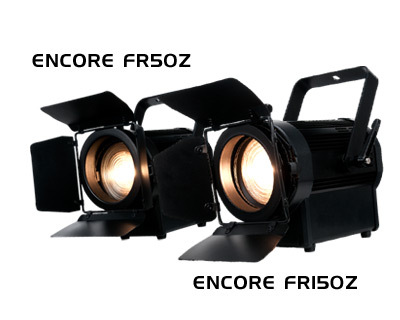 The Encore FR50Z is equipped with a 6-inch Fresnel lens and is powered by a 50W LED engine. It’s flexible warm white beam is ideal for use in small-to-medium-sized theatres as well as for touring productions and conference work. It is also compact and light-weight, making it ideal for venues with limited space and for small tours and one-off events when transportation space is limited. For situations where a more powerful beam is required, the Encore FR150Z utilizes a potent 130W LED light-source and features an 8-inch Fresnel lens. It creates a high-octane beam that is perfect for use in bigger theatres and on large-scale productions. Both fixtures offer smooth 0-100% digital dimming and can be controlled using the standard DMX-512 control protocol for easy integration into an existing lighting system. A 16-character backlit LCD display menu located on the side of each unit makes it easy to select a DMX address as well as any of the fixtures’ operating options. Professional 3-pin XLR input and output sockets allow for connection to a DMX controller, while the fixtures are also fitted with high-quality locking powerCON input and output sockets. These can be used to daisy chain together for multiple fixtures from a single power supply in order to reduce cable runs. Thanks to the use of long-life LED light-sources, blown lamps prior to – or, worse still, during – a show won’t be a concern when using the Encore FR fixtures. Other advantages include low power draw as well as minimal excess heat, which will make for a cooler – and therefore more comfortable – stage environment for performers. With robust extruded aluminum cases, these are professional fixtures designed for reliability even when used in harsh touring environments. The FR50Z measures 11.5” x 9.5” x 9.5” / 288 x 237 x 237mm (LxWxH) and weighs 10 lbs. / 4.2 kg., while the FR150Z has dimensions of 14.75” x 11.75” x 11.5” / 376 x 298 x 294mm (LxWxH) and a weight of 16 lbs. / 6.9 kg. Both units are fitted with flexible brackets, which can be easily secured into place at any desired angle using the large locking levers fitted to either side. Combining the benefits of modern LED light-sources with the features of a traditional stage lighting Fresnel fixture, the ADJ Encore FR50Z and Encore FR150Z offer the best of both worlds. Low power consumption, minimal excess heat and long lamp life are combined with a wide zoom range and barn doors to create a pair of truly versatile fixtures. Added to the existing Profile fixtures, the Encore range now offers a complete LED-powered professional stage lighting solution. If you have a stage to illuminate, as part of a permanent installation, tour or one-off event, look no further than the ADJ Encore Series. Both the Encore FR50Z and Encore FR150Z are available from ADJ USA.